In 2018, some much-deserved recognition has come to Nina Simone, born Eunice Waymon in Tryon, N.C. in 1933. The world famous jazz singer known as the High Priestess of Soul was inducted into the Rock and Roll Hall of Fame in April, 2018. Her childhood home was designated a National Treasure by the National Trust for Historic Preservation. In June, audio stories of her childhood were created on UGo Tour – text ‘Nina’ to 555-888 to listen or listen online. Young Simone had natural musical talent and the Tryon community came together to support her musical development through lessons and performances. Later, she would introduce the world to a unique musical infusion of pop, gospel, classical, jazz, folk and ballads that she called “Black Classical Music.” Her voice and music were instrumental in the American Civil Rights Movement. 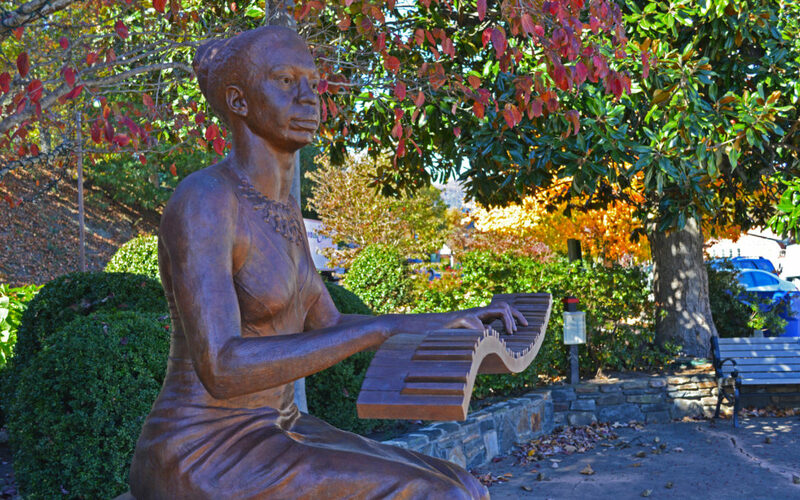 In 2010, her eight-foot, bronze-cast sculpture was dedicated in Nina Simone Plaza in downtown Tryon.